Lighting-Gallery-net - Mercury vapor lamps/Old area light please excuse The Shoe Box lights in the back ground . Old area light please excuse The Shoe Box lights in the back ground . I got this at a restore for five bucks I do not know who made it. Mar 25, 2018 at 06:53 PM Author: Cole D.
Looks like it might be a Regent. I remember my parents had one in our backyard at our old house. Plus my neighbor across the street has one but it's not used anymore. It could be American Electric/Electripak also.. I have a second one but I bought it at a different location. I have another one just like it and it says Itt as the brand name. 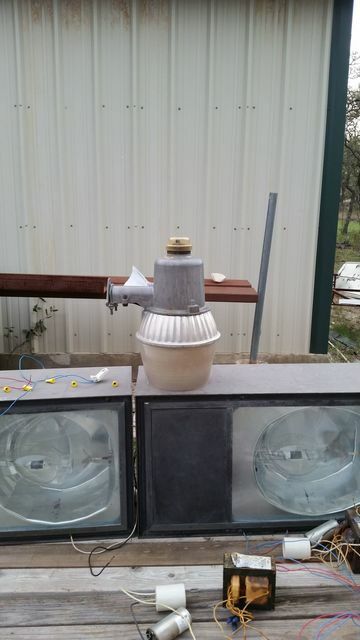 The 400 watt metal halide shoebox lights are made by Kim Lighting. Yep...black PC plug gives it away. Appears to be a Regent.